It was summer in Bangladesh. I had been invited to attend a training session on Heritage and Buddhism at Paro, Bhutan. Known as T-t-T [Train the Trainer], it was organised by UNESCO and ADB, and funded by Japan. I was excited to visit a foreign country for the very first time. I was left baffled by the beauty that Bhutan had to showcase. I found it to be a country of rich culture, and how they conserve their heritage, unlike some of the other SAARC countries. Thanks to Bangladesh Parjatan Corporation, National Tourism Organisation, I got the opportunity to experience this cultural exchange programme. The Bhutanese protocol officer Mr. Tandin Nidup, a very warm and polite gentleman, was waiting at the airport to pick me up. I fell in love with the hospitable weather. I had a reservation at the five-star hotel Zhiwaling Hotel, which holds the 11th position in the world for representing culture and heritage through its décor. After the 25-minute drive to the hotel, I was warmly welcomed with flowers, a silk scarf engraved wit Bhutanese religious inscriptions. I came across many Americans and Europeans visiting Bhutan. Other than people belonging to the SAARC countries, foreign visitors had to pay 200 USD a day. The trainers in the programme had come from Singapore, United Kingdom, Hong Kong, Macao, Canada and Malaysia. Richard Engelhardt, the Regional Advisor for Culture in Asia and the Pacific, UNESCO, spoke about the cultural elements and heritage points that he came across in Bangladesh when he visited, namely, Paharpur and Sundarban. Participants from India, Srilanka, Nepal and Bhutan were already at the hotel. Finally, we were told that we could take a tour to Taktshang (monastery) or the Tiger's Den in the after noon of the same day before the inauguration of the programme. 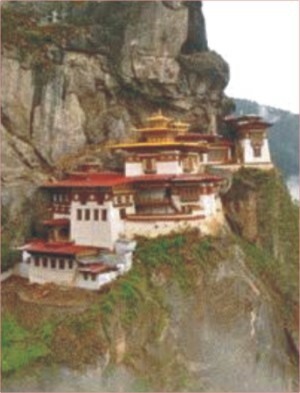 Taktshang is one of the main pilgrimage sites for many Buddhists. People from all over the country make it a point to visit the monastery at least once in their lifetime. A 20-minute drive from the hotel, at one point, people are seen hiking for almost an hour and a half to the teahouse from where the walk is said to get easier. The walk gets challenging as one goes higher up and the path gets steeper. But the breathtaking view of the monastery on the cliff, the cool breeze that brushes against one's hair and cheeks and the rich vegetation along the way, makes the hike worthwhile. From a distance, the monastery seems to be a hanging nest. It is believed that those who visit the monastery and pray there, after a tiring hike, will enjoy a long and enriching life. On a fine Saturday morning, the programme began. Around 24 participants had been divided into four groups. We had been assigned to work at Paro, Drugyl Djongs and the National Museum. The Bhutanese admire the Djong from both national and religious points of view. The great fortresses known as 'dzongs' are among the most striking examples of Bhutanese architecture. Rising proudly at strategic places, at the entrance to the valley, at the summit of a hill or at the confluence of two rivers, dzongs are built on a grand scale without the help of any drawings and held without a single nail. 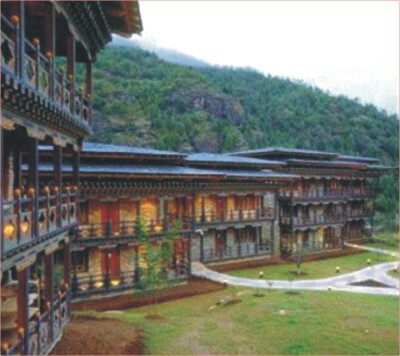 They are outstanding examples of Bhutanese architecture. Reflecting upon religion, society and spatial organisations, the dzongs symbolise the history and long independence of Bhutan. On the other hand, the National Museum of Bhutan is situated above the Paro Dzong in the old watchtower, one of the earliest constructed buildings in the country. The collection in the museum includes weapons and stamps, birds and mammals, and a good display of ancient Bhutanese art and artifacts. A majority of the Bhutanese population still continue to live as it had for centuries -- in small isolated farms and hamlets, surrounded by terraced fields of rice, maize and buckwheat. Higher up, many people live in tents woven from yak-hair, spending at least part of the year on the alpine pastures among their grazing livestock. One trait that is common to all Bhutanese is hospitality. Custom dictates that simple hospitality is extended to any and all guests, even to perfect strangers. In Bhutan, everyone seems to wear a smile. Perhaps this is due to their deep-rooted Buddhist faith, or may be their sense of contentment is due to their self-sufficient lifestyle. Whatever the reason, the Bhutanese project an apparent inner happiness that travelers will remember long after their visit.